Although raised in modest, humble surroundings, my childhood was filled with happiness and more than my share of blessings. While we didn’t always have the luxuries of life, my father worked two and sometimes three jobs to make sure we had all the necessities. And my stay-at-home mom seemed to have an uncanny knack for stretching the dollar further than just about anyone I’ve ever known. In spite of the fact that many evening suppers were simple, consisting mainly of vegetable dishes, there was one day each year that our dining table gave the appearance that we were fairly well off, if not rich–at least in my mind. That day was Thanksgiving. Both of my parents were raised as hard working Oklahoma dirt farmers. And if there’s one thing that farmers know besides their fields it’s how to put together a family “feed,” especially on Thanksgiving. Obviously my father and mother were no different. Thanksgiving at our house always started about a week before that Congressionally designated fourth Thursday of November–shopping for ingredients, making cornbread for momma’s famous cornbread stuffing, boiling up the fresh cranberry sauce (we never served the canned stuff at our house), and the baking of mincemeat pies (my momma’s favorite), pumpkin pies (actually sweet potato most of the time), and her famous coconut-pineapple layer cake. Early Thanksgiving morning, it was all hands on deck in order to complete the meal and other tasks before relatives and friends arrived. Of course we always had green beans (in the mid-1950s it became green bean casserole), sweet corn or squash casserole, mashed Irish potatoes, creamy yams with marshmallow topping, and my momma’s ambrosia. About the only non-traditional thing we served was roasted chicken instead of turkey because my father didn’t like turkey. Some years we even had a small ham as well. Have you ever wondered how the Thanksgiving traditions and foods of today compare to those of that first Thanksgiving feast? Let’s take a quick look. 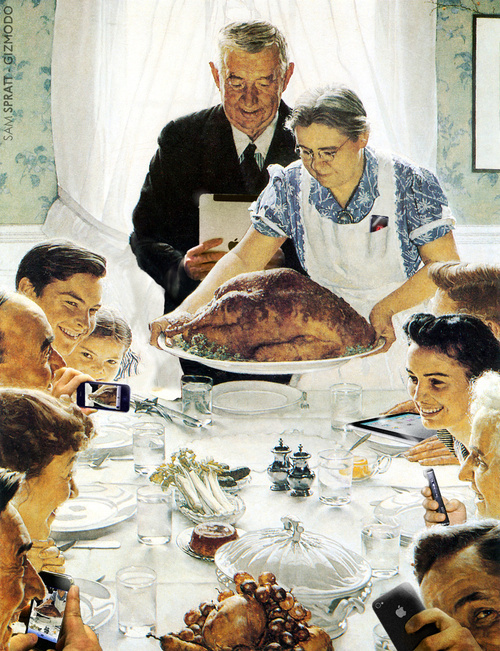 Historians tell us that the original Thanksgiving festivities lasted at least three days. Not only did the colonists and their ninety or so Wampanaog guests hunt and feast, they also showed off the proficiency of their weapons with a little target practice. 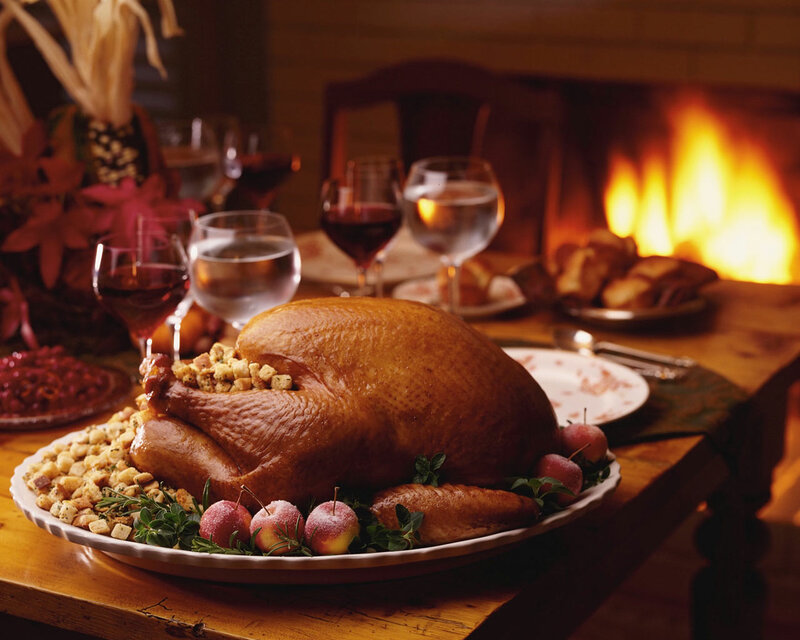 The meat served at the first Thanksgiving was primarily venison and various birds. And while wild turkey was possibly among the fowl served, it was almost certainly not the centerpiece of the table as it is today. Research shows that during the early colonial period the fowl of choice for both the Pilgrims and Native Americans was goose, duck, and passenger pigeon. 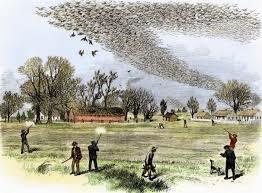 It is said that passenger pigeons, although now extinct, were so plentiful in the 1620s that a man could bring down well over a hundred birds in flight with a single shot from his musket. Small birds were usually spit-roasted, while larger fowl were boiled before roasting. Other meats enjoyed during these festivities likely included eels, clams, mussels, lobsters, and fish, since it is known that smoking and drying various sea foods was common during the time. Stuffing is another food that differed greatly from that of today, since bread was made from maize instead of wheat. Pilgrims and Native Americans alike probably stuffed their birds with onions, nuts, and various herbs. One researcher mentions a 17th-century stuffing recipe for goose that was primarily just shelled chestnuts. Potatoes, neither white or sweet, were not eaten at the first Thanksgiving since they were discovered in South America by Spanish explorers and had not yet been introduced to North America. The local Native American inhabitants did enjoy turnips and other root vegetables, which most were most likely served alongside other vegetables like squash, beans, cabbage, carrots, and peas. Corn was plentiful and would also have been served, although the kernels would have been removed from the cob and turned into cornmeal from which porridge or flat bread would have been made. Various fruits, including plums, grapes, gooseberries, raspberries, and cranberries were also eaten by both the Native Americans and Pilgrims and would probably been included in the Thanksgiving bounty. However, it would be another fifty years before they would be boiled with a sweetener to make sauces and relishes to enjoy with meats. Pies of any sort is another dish that was not served at the first Thanksgiving since they had not yet been developed in the New World. Pumpkins and other squashes indigenous to the area were probably roasted over hot coals and enjoyed as another accompaniment to the meal. Hopefully there is one we have in common with participants of the first Thanksgiving–a celebration of thanks for all God has provided. So whether you enjoy a huge family Thanksgiving meal or just sit around watching the football games with friends, take just a moment to give thanks for all of this year’s blessings. This entry was posted in Uncategorized by grubamericana. Bookmark the permalink.